Students enter Casino Del Sol for 2013 Tucson International Mariachi Conference workshops. This is the sight I most enjoy seeing. Kids with instrument cases walking in to attend workshops at the Tucson International Mariachi Conference. 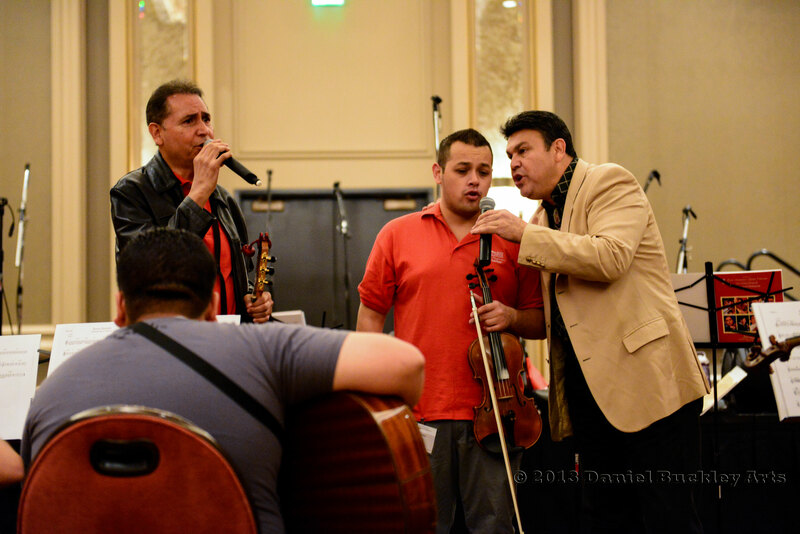 Masters workshops with Mariachi Sol de Mexico de Jose Hernandez. 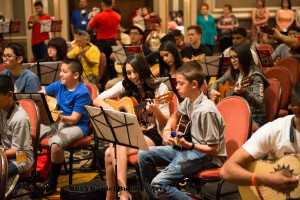 This year over 700 mariachi and folklórico students attended the three days of workshops at the Tucson Conference, where again they learned from masters of the music and dance. Jose Hernandez’s Mariachi Sol de Mexico taught the masters students, while level I, II and III students studied with members of Susie Garcia’s Mariachi Las Colibrí and top teaching talents from various schools and groups in Tucson. 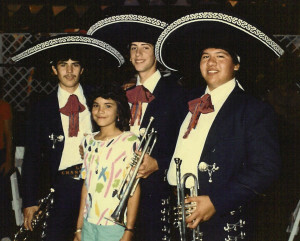 Dr, Jeff Nevin (second from right) as he looked when he was a member of Tucson’s Los Changuitos Feos. 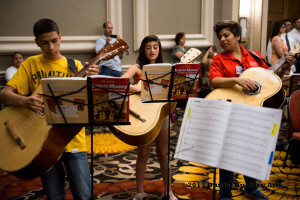 The beginning classes used texts written by Dr. Jeff Nevin – a Tucson native and former member of Tucson’s first youth mariachi, Los Chaguitos Feos (The Ugly Little Monkeys). Nevin, who holds his doctorate in composition, created the country’s first college level accredited mariachi program, and has written outstanding instructional books. On hand as well was one of the truly historic figures in mariachi music, trumpeter/composer/arranger Don Miguel Martinez. Martinez is to the mariachi trumpet what Louis Armstrong was to the jazz trumpet – literally the inventor of every aspect of the instrument’s sound in the genre, from solo expressions to two and three part harmony and counterpoint. 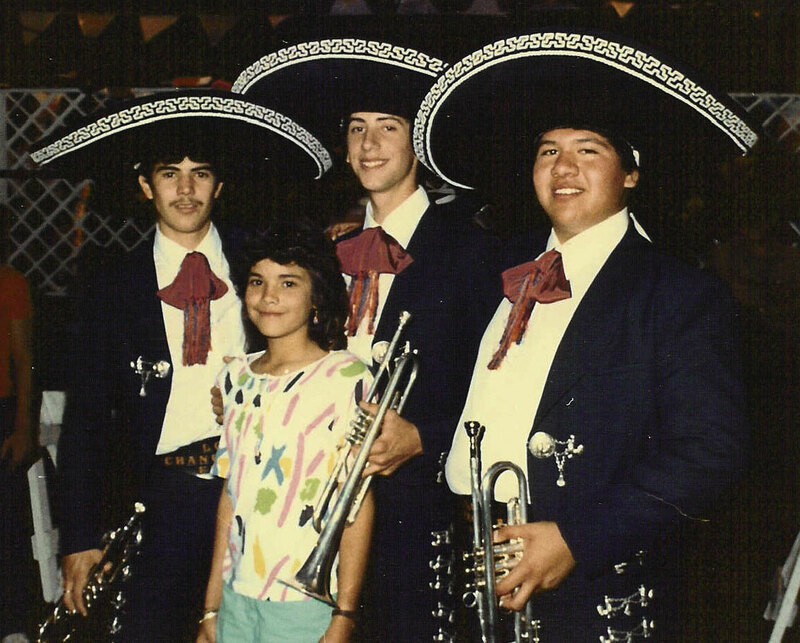 Don Miguel was the first trumpet player of the group that is widely regarded as the Beatles of the mariachi world, Mariachi Vargas de Tecalitlán. Don Miguel Martinez (left) with Jonathan Clark. 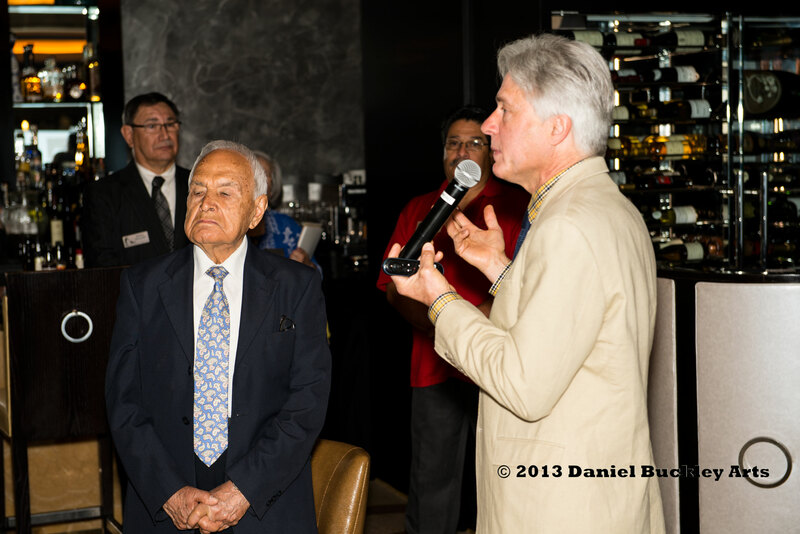 Martinez, now in his early 90s, is on the road with mariachi historian Jonathan Clark, telling of his days with Vargas and his times recording with some of the greatest names in mariachi music. He had copies of his autobiography – Mi vida, mis viajes, mis vivencias: Siete décades en la música del mariachi – as well as three CDs of long out of print Martinez recorded classics for sale, and graciously autographed any for those who wanted them. Jose Hernandez and members of Sol de Mexico working with masters students. He insisted that the student musicians get it right, and they rose to the occasion. In other rooms where the different levels from beginners to near masters worked I saw similar attention to detail and generosity in working with the students. I watch Las Colibri’s guitarrón player work with individual students, teaching them precisely how to lock their often skewed instrumental lines into the polyrhythmic fabric of each tune. 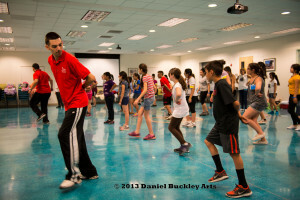 Members of Tucson’s Ballet Folklorico Tapatio work with young dancers. Over in the Pascua Yaqui Wellness Center where the folklorico dancers worked with Universidad de Colima’s Juan Carlos Gaytan Rodriguez and members of Tucson’s Ballet Folklorico Tapatio, it was the same story. Patience, precision, and gentle demanding of a higher level of dancing was the hallmark of each of the teachers, and one could see the young dancers making the steps part of their muscle memory as time went on. Worth mentioning as well is the generosity of the Pascua Yaqui Tribe in making this world-class facility available for the dance workshops. 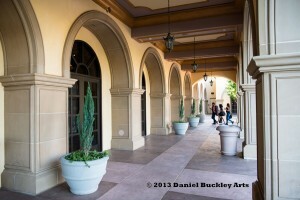 On the final day of workshops, the students were broken into small groups scattered all around the inside and outside of the Casino Del Sol hotel. The teachers were mainly working on rudiments with the students. At first I thought that was odd, but upon reflection I realized how right that was. On the first day, these kids were excited and wanted to jump straight into learning new repertoire and getting tips on style. By the end of the second day they had most of that down. And so on the third morning it was a good time to focus on the habits of music making that would make them better players and singers over the long haul. 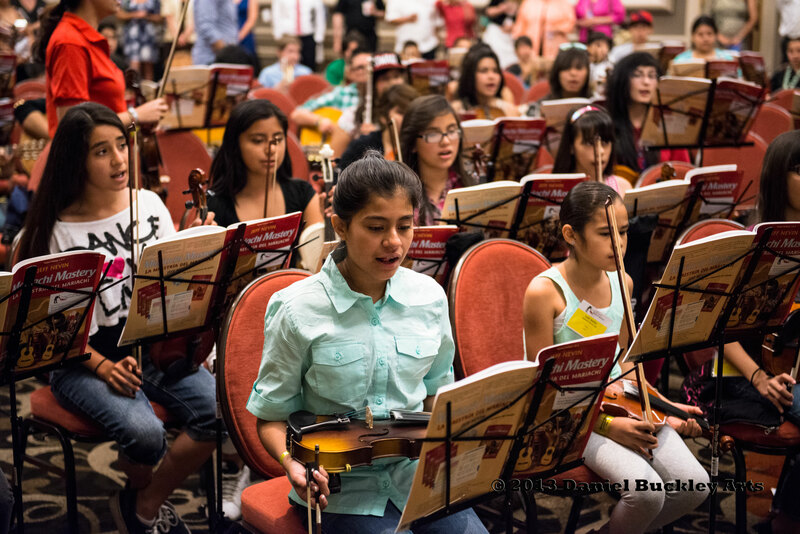 Alberto Ranjel and Andrea Gallegos worked with small groups of young violinists, teaching them proper posture, how to hold the instrument for maximum long-term comfort, and how to really apply all that the bow can do. In the hallway Jeff Nevin worked with young trumpet players on warmup skills and more, while members of Mariachi Sonido de Mexico, Mariachi Las Colibri and others taught similar skills to their small instrumental groups. The educational component has changed a lot over the decades, and been fought over sporadically by those with different ideas of how to best serve the students. 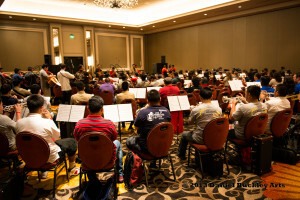 Many different groups have taught the workshops in Tucson over the years, from such big names as Mariachi Vargas, Mariachi Cobre, Mariachi Los Camperos de Nati Cano, Mariachi Los Arrieros and Mariachi Nueva Tecalitlan to many other local instructors, and probably a few headliners that I’ve forgotten. Maestro Rafael Zamarripa similarly took the folklorico area to a high level, aided by Tucson greats from the folklorico dance fields as well. But over time a more well thought out educational process is taking hold, not just here but all around the conference scenes in America and Mexico. The different conferences emphasize the workshops to greater or lesser degrees, but it still remains a prime focus in Tucson. And when one considers the fact that all of the members of Mariachi Las Colibri, which wowed the crowds both at the Espectacular and Garibaldi concerts, came to Tucson to study at the workshops over the years, the conference has a pretty good track record. I will likely come back and add more to this as my memory is jarred, but I’ll leave it for now. Tomorrow I will talk about the Participant Showcase where the students in their own groups get to show off their stuff. That’s always my favorite part of the conference. 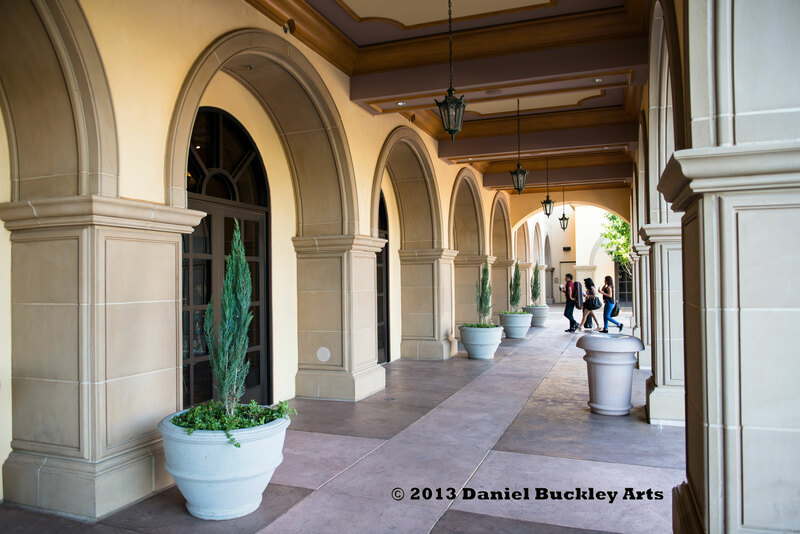 ~ by Daniel Buckley on April 29, 2013. I love the mariachi workshops, and was priveleged to sit in on the very first ones, taught by members of Mariachi Vargas. The sense of pride and accomplishment among the students has stayed with me. I wish more people in our community could have the experience of attending these workshops. The lessons learned apply to all areas of their lives, and for many it’s one of the too-few arenas in which they can excel. So, Dan, I hope your history communicates the importance of the workshops, which I think are the most important part of the festival!